Frequent Use: Dilute with 2 parts water. Infrequent Use: Apply undiluted. Apply by spray, sponge, or cloth. Keep surface wet for a few minutes. Scrub and rinse. Heavy encrustations of lime and scale may require initial cleaning with The Natural Toilet Bowl Cleaner. Ozone Treated Water (for purification), Sodium Citrate (from a reaction of citric acid from fermented corn and sodium hydroxide), Non-Ionic Detergent (from corn-derived ethanol and natural oil), D-Limonene (pesticide-residue free, distilled from orange rind oil), Sodium Gluconate (from a reaction of gluconic acid derived from fermented oxidized corn glucose and washing soda), Amphoteric Detergent (from coconut and/or palm kernel oil). Contains no preservatives. "Our water softener wasn't functioning for several weeks and all of our drinking glasses developed a cloudy film that couldn't be removed even with lots of elbow grease. Just before a dinner party my wife assigned me the job of making those glasses sparkle. Being short on elbow grease, I tried your Basin, Tub & Tile Cleaner. I just sprayed it on and wiped off the build! The glasses sparkled like new! The whole project went so quickly, I looked for other things to clean (to the complete astonishment of my wife). I found the Basin, Tub & Tile Cleaner also completely removed the perennial coffee and tea stains in our white ceramic coffee mugs. Your products have restored the fun to cleaning. "Your bathroom cleaner is wonderful. It takes off all the deposits left from our hard water and makes all of my chrome faucets look new. Keep up the good work." "The Bathroom Cleaner really does a good job on soap scum in the bathrooms. We have a number of children that come through our business on a daily basis. I wanted our cleaners to be safe for them and the environment. We chose your products because they have no hazardous ingredients. I don't want to dump that stuff into our septic system." * Biodegrades without forming micro toxins. Contains no hazardous ingredients as per OSHA regulations. 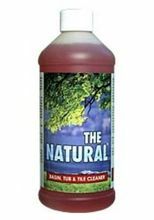 * Free of acid, butyl ether, ammonia, chlorine, phosphates, benzene, pine oil, or strong alkalis.